Awarded for the hack that makes us smile (even if for the wrong reasons)! · Social Impact – how well does the solution address the challenge or problem? · Innovation and Creativity – how creative is the solution? Does it bring new ideas and approaches to solving the problem? · Completeness of Solution – is the solution finished? Does it work? Is there a roadmap for future enhancements? · Sustainability – is the solution sustainable within the context of the community it’s aiming to impact? · Design - is the solution well thought out and designed?" Awarded for the hack that pushes the boundaries of what we consider possible! Awarded for the hack that best embodies the mission of this year's hackathon! Given for the best use of ITG data OR is fintech-related! Best use of Microsoft Technologies! For the best use of GCP in a hack! For the best use of Mathworks in a hack! 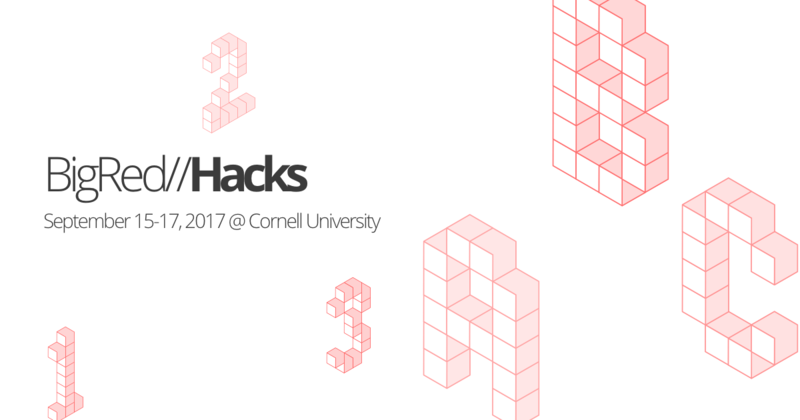 BigRed//Hacks is the oldest student-run, large-scale hackathon at Cornell University. Across three days, students from all across the US will gather to build the coolest and most innovative projects, meet amazing people, and win some prizes along the way! This year, BigRed//Hacks seeks innovation in education. This will mean something different to every person. Perhaps, this means transforming the classroom, which has looked relatively the same for the past 100 years, into a dynamic experience for the next generation with technologies as reactive as students. To others, this will mean using the wide reach of the internet to ensure education is truly the great equalizer for the underrepresented, the quiet, and the forgotten. To you, this should mean something special; the experiences we live through, the opportunities we take, and the people who touch our lives and shape who we are. Education happens both within and without the classroom, and convention should not limit what you decide to build. We want you to learn and show others how to learn. We want you to speak with your audience and be spoken to. Most of all, here at BigRed//Hacks, we want you to be empowered and empower others. * We encourage all developers regardless of technical ability or hackathon experience to apply. Admission and food is free for all hackers. Please see bigredhacks.com/register for more details! No part of the submission may be created outside of the 36 hour hackathon window, and any external code, images, or content must be equally available to all participants, licensed with permission to use, and follow all applicable laws. Register online at bigredhacks.com ! Once accepted, your dashboard will give you more details on travel reimbursement, buses, and other information! Is the idea original and unique, or just a copy of something that already exists? How difficult was the project to build? Of the technologies used, were they used well? Does the project look put together and complete? How is the user experience? Could you see this project being used in the future beyond the hackathon, or is it just a one-time deal? How well did the team demonstrate their project?